Welcome to the AMC Eagle Nest! This page is your portal to the premier AMC Eagle site and is for anyone interested in the last true American Motors Corporation automobile. We have information regarding all models of the AMC Eagle: the Kammback, SX/4, 2 and 4 door sedans, wagons, Sundancer and even the rare Turbo Diesel. Our members own everything from showroom quality cars, to daily drivers, to mud racers and rock crawlers. 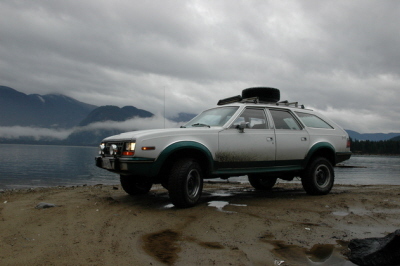 The AMC Eagle Nest was launched in December 2003 and is supported and maintained by a dedicated group of AMC Eagle owners and enthusiasts. The most active part of this site is our forums which you may link too by using the button at the top of this page. Our newest addition is the AMC Eaglepedia which is a constantly evolving source of indexed AMC Eagle information which may only be accessed if you are the member of the forums. We invite you to take a look around and consider becoming a member (its free and easy)and ownership of an AMC Eagle is not required. Thanks for visiting our site and we hope you come back often. We hope that future Eagle owners will benefit from this site and forum as much as current Eagle owners. None of us are experts, but we enjoy driving and improving our Eagles. So we hope you enjoy this site as much as we liked building it. The site is constantly evolving with exciting changes and features being added. So check back often! Don’t miss our lineup of Member selected Rides of the Month!!!! !Click the ROTM Image below to view them.